Hi, I am interested in your 1933 Buick Series 50 (stock #5040-CHA) listed on Autotrader for $38,995. I'd like to get more information about this vehicle and confirm its availability. 1933 Buick Series 50 Model 57 is wonderfully colorful, highly authentic, and has a jaunty style we rarely see anymore. Mid-30s classics are always a special presentation. We were still in The Great Depression, and a style like this was seen as an extravagance fewer could afford. 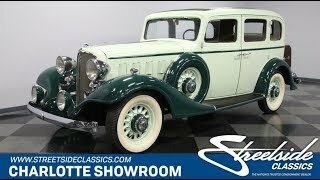 Today this restored sedan proves this lavishness with a tasteful and bright two-tone green paint design. The light and dark green are expertly intertwined as it highlights some of the best features in the car. This includes the flowing fenders, full-length style line, folding external trunk rack, and full-size spare embedded in each front fender. While we all love the look of whitewalls, people might be even more impressed by the color coordination of the wheels, where even the Buick center cap is green. Even the black rubber on the running boards match the top of the roof. Its a total package that leaves a lasting impression. A broadcloth interior with plenty of room means youre getting the best of true old-school luxury. Sure, Buick wasnt producing Pierce Arrow levels of prestige, but we cannot help but think upper class when we see how nice the button top plush seats are. Plus, the matching door panels and wood trim really make this one a special place to log in some miles. While you could enlist a chauffeur, you would miss out on the time machine feeling of grabbing the large three-spoke steering wheel and watching the factory gauges dance as you amble on down the road. Buicks 230 cubic-inch straight-eight is likely to draw a crowd with its impressive long block. And while the green block looks like its part of this cars upgraded color package, its actually correct for Buicks of this era. In fact, this is believed to be the original motor. Anyone looking at the engine bay will easily believe this thanks to a highly authentic presentation right down to the tag on the generator. Best of all, this torquey motor makes that proper 1930s sound going down the byways you know, that invigorating rhythmic chug. You also can handle around-town driving without breaking a sweat thanks to the synchronized three-speed manual transmission. We just dont see Buicks like this anymore. So you might want to call today, or you might regret it tomorrow.